The city of Vandalia, Ill., hosted a Brownfields Public Field Day to help citizens learn about the city’s Brownfields Program and to observe testing on a Brownfields property located on a high-traffic street corner with strong potential for redevelopment. Members of Terracon’s St. Louis office have been involved with Vandalia’s Brownfields efforts for several years and helped plan the event. Brownfields cleanup grants are competitively awarded by the United States Environmental Protection Agency (EPA) to fund research that determines the extent to which a property is environmentally contaminated, or if it is contaminated at all. Often, buyers avoid a property if it is even rumored to be contaminated. Brownfields funding pays for research to help parties understand their liability during property transactions. Equipped with this information, the property can be effectively marketed for re-use as buyers know exactly what they’re getting. This communication can help revitalize cities and towns ready to attract new growth. When Vandalia chose to pursue a Brownfields grant, they turned to the St. Louis office for help with the application process. Terracon spent several months working with the city on their application, pro bono. In 2010, the city was awarded a $200,000 grant. To date, Terracon helped the city identify 88 potential sites and investigated five of the sites that scored highest on the city’s prioritization list. The Brownfields Public Field Day event was beneficial for citizens and potential investors, but it also provided an educational opportunity for students. The day before the event, Terracon employees visited a local middle school and talked with seventh graders during their science classes. They introduced the Brownfields Grant Program, teaching them that it is like “recycling land.” Then, students drew pictures depicting their ideas about what kind of business they would like to see on the property being tested. These ideas were displayed at City Hall. 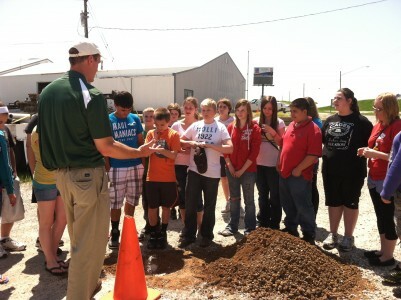 The seventh grade classes took turns viewing the site the following day. In addition to teaching the children about environmental sustainability, this outreach effort also covered education and entrepreneurship. They also go home and talk to their parents about what they learn, which can help build support for the EPA Brownfields Grant Program.